Picture this. You are invited to Thanksgiving dinner at the home of someone you have never met before. In other words, you are a guest. Just as a host has responsibilities, so does a guest. Do you arrive on time? And when is that? If dinner is at 5, do you arrive at 4:50, 5:00, 5:15 or 5:30? Legendary football coach Vince Lombardi is often quoted as having said, “If you are five minutes early, you are already ten minutes late.” It is out of respect for the work your host has done in advance to prepare your meal and their home that you arrive on time. We subscribe to arriving at the stated time and it is acceptable to arrive as much as 15 minutes late. If for some reason you are going to be later than 15 minutes, call your host. Just sending a text probably won’t get read in a timely manner. If you send a text, call as well. A host is going to be busy with last minute details, including greeting guests at the front door, taking coats, and may not know you have sent a text. They will hear their phone ring, however. Do you arrive with a host gift? You should. Again we are talking about respecting the work and effort your host has done to prepare for your dining pleasure and to say thank you. It doesn’t have to be an expensive gift. You could bake a batch of cookies for them to enjoy at a later time. You could bring a bottle of wine and if you do, please attach a tag with your name on it so your host will know who gave it to them. (Hint to host – have a specialty pen on hand so you can write the guest’s name on the wine bottle and maybe the date you received it. Then when you consume it, because you are not obligated to serve the wine that day, you can send a thank you note to the guest saying how much you enjoyed it!) A host gift could be a seasonal kitchen towel. A cook can never have too many towels! It can be a small box of chocolates, or a thank you note of appreciation for including you in the festivities and enclose a gift card to a coffee house. Flowers are always a safe gift, but please do the host a favor and buy flowers in a vase! Lastly remember to put a card or tag on your host gift. When the party is over the host is not going to remember who gave them what and they’ll want to know. Whatever you bring, just remember it is part of your responsibility as a guest. 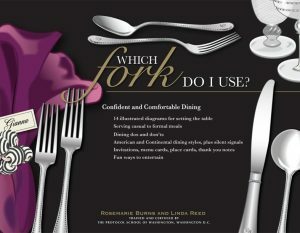 Tomorrow, we’ll address table manners a guest must heed. Until then, start looking for that special host gift to take to your next dinner party!